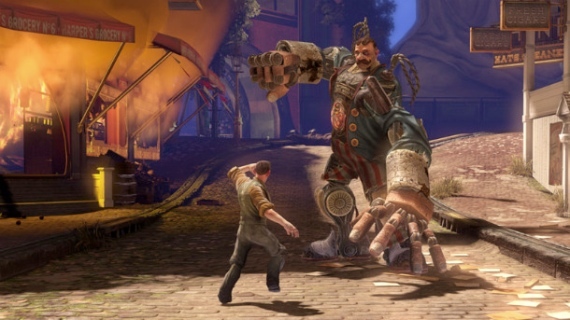 BioShock Infinite, rated M (for Mature), hits Tuesday for Xbox 360, PlayStation 3 and PC. The first-person shooter puts players into the shoes of Booker DeWitt, sent to the floating air-city-slash-floating-battleship of Columbia to rescue a young woman named Elizabeth from her captors. As the two attempt to make their escape, the city’s two warring factions pursue, which drives the game’s action. BioShock Infinite is the third game in the BioShock series and the second to be developed by the team that created the original (BioShock 2 was was developed by different divisions of 2K instead of the original Irrational team headed by Ken Levine). The original game, much-lauded as an “intellectual’s FPS,” wove heavy ruminations on Randian objectivist philosophy and player agency into the narrative, while BioShock 2 pitted objectivism against collectivism; Infinite considers American exceptionalism and religious extremism. Are you excited for Infinite to drop this week? Why or why not? Does this launch trailer get you more pumped? Let us know in the comments below.